The marketing arm and subsidiary of the European Handball Federation, EHF Marketing GmbH, and Sportradar have announced a long-term agreement, which will see the global leader in data and digital content provide a range of data, streaming, marketing and digital services for the federation’s European Cup competitions. Sportradar will now become the ‘official streaming and data partner of the EHF club competitions’. The partnership will be officially unveiled at the ‘European handball goes Tech’ business event, taking place on 2 June, ahead of the start of the VELUX EHF FINAL4 in Cologne. The agreement includes the collection of live data and comprehensive statistics for over 650 European Cup matches per season across all of the EHF’s top club competitions including the men’s and women’s EHF Champions League, EHF Cup and Challenge Cup. 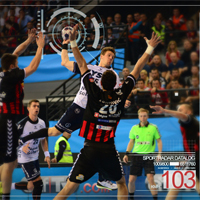 With sports, marketing and technology experts attending the ‘European handball goes Tech’ event in Cologne, Sportradar will also use the opportunity to launch its latest product ‘Sportradar OTT’ to sports federations worldwide. This new service will form part of the partnership agreement with EHF Marketing GmbH and includes the provision and development of the federation’s own OTT platform, ehfTV.com, as well as marketing rights for all digital content for the EHF’s club competitions. Advertising and sponsorship on digital platforms in addition to all non-digital advertising and sponsorship from the betting industry are also included. As part of the deal, Sportradar will now also work closely with the EHF and EHF Marketing media teams on the creation and further development of digital content both for ehfTV.com and social media channels. Commenting on the agreement, David Szlezak, Managing Director of EHF Marketing GmbH, said: "We have recognised the huge importance of providing high quality, accurate data from the EHF’s competitions and we are delighted to have agreed a long-term cooperation with the industry leader, Sportradar." "For the first time, we will be able to provide clubs, media and fans with extensive live statistics and data from every single European club match throughout the season. We are looking forward to working with Sportradar to realise the full potential of this data. Furthermore, Sportradar’s innovative approach to OTT will allow us to continue to expand our own platform, ehfTV.com." Carsten Koerl, Sportradar CEO, said: "We sometimes ask sports federations to open their minds and imagine the impact that a joined-up approach across a range of areas can bring. Not all of them can. EHF Marketing, however, grasped the opportunity immediately and with a long-term deal in place, this will be a truly collaborative approach that will ensure that our offering across the EHFs club competitions chimes perfectly with the evolving needs and wants of their fans, sponsors and stakeholders." Speaking ahead of the ‘European handball goes Tech’ event about the launch of the new ‘Sportradar OTT’ for sports federations, Carsten Koerl, said: "While we are already well-respected and established streaming and content provider to the betting industry, we tasked our team to really disrupt the existing models of streaming across all digital platforms. "I wanted them to find solutions that would resonate for a whole range of federations across the world and across sports. What they have come up with, and what we are able to offer is genuinely unique: a fully customisable offering that can be adapted to a whole range of unique circumstances. "ehfTV.com is one such platform with bespoke branding, front end and revenue share structure. In certain circumstances we will even be able to offer the OTT service at no cost. That should pique the interest of rights holders across sport." Sportradar is a global leader in understanding and leveraging the power of sports data and digital content for its clients around the world. The Sportradar group is a truly international organisation, employing over 1,650 people in more than 30 locations around the world. The company’s rapid growth is driven by technological innovation and a deep understanding of its clients’ business needs. It is Sportradar’s commitment to excellent service, quality and reliability that makes the company the trusted partner of more than 800 companies in over 80 countries. Sportradar occupies a unique position at the intersection of the sports, media and betting industries. Further information can be found on the Sportradar website: www.sportradar.com/. ‘Sportradar OTT’ is founded on an innovative approach to how a rights holder and Sportradar can cooperation around audiovisual rights. Sportradar OTT provides rights holders with a customisable OTT platform where the rights holders can maintain their own brand and CI. Both parties contribute their expertise in the areas they are excel in, with Sportradar taking care of the technical provision & maintenance of the platform as well as monetising the traffic through a pay and/or an advertising based model, while the rights holder can focus on providing and managing the content. All revenues that are generated are shared, minimising the risk and outlay for federations and competitions of all sizes.